Rianforest Bar Table for Restaurants, Bars, Wine Cellars, and homes. A tropical rainforest was the source of inspiration for this unique bar table. Aptly named, the Rainforest Bar Table with Copper or Brass Top was designed for upscale eclectic homes, pubs, restaurants, wine cellars, and bars. Bringing the outdoors in, it makes an exceptional copper or brass bar table for the game room, man cave, or home bar. The table top is constructed of heavy duty 43 mils (18 gauge) copper or brass sheet which can be made any size up to 42″ wide x 42″ deep. The sheet metal is stretched over a robust steel frame and NOT cheap particle board or plywood. It is lightly distressed and antiqued. Underside of the table top is coated with sound deadening material. The base of the table is made by a casting process. Molten metal is poured into a sand mold which can be used only once. The rough casting is smoothed by careful hand filing. This is a long and laborious procedure requiring painstaking attention to detail. It then receives a multi-layer hand-applied finish. The brass footrest adds that final touch which sets this table apart from the rest. 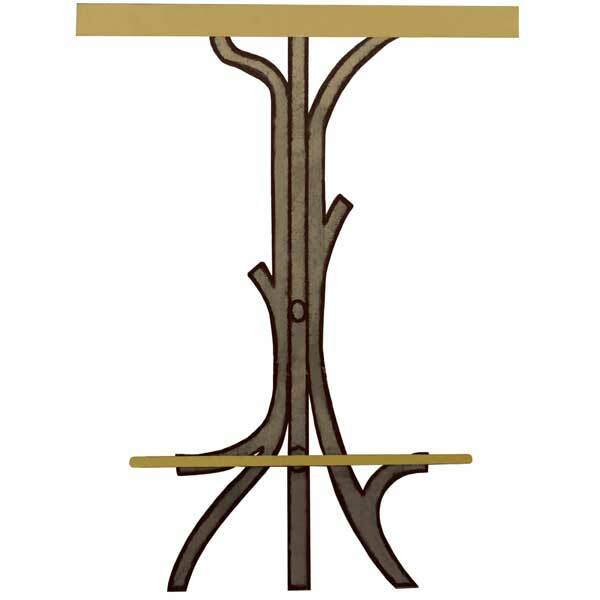 The Rainforest Bar Table with Copper or Brass Top was designed by Shah Gilani, ISFD. Custom sizing is available.